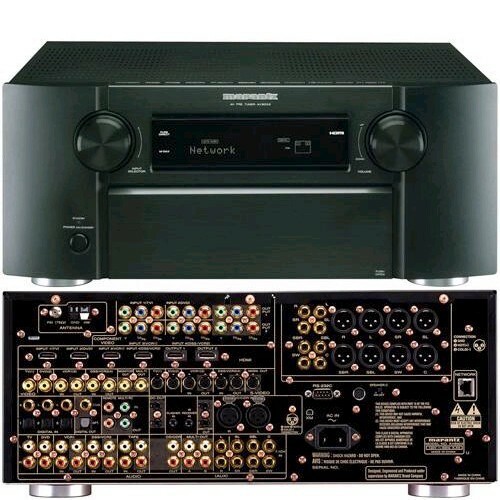 AV8003 signals Marantz's re-emergence into the ultra-competitive AV separates market. The AV8003 is one of the less expensive surround sound processors and is positioned to attract those who are on the verge of buying separates or considering one of today's uber-receivers but who prioritize sound quality over bells and whistles. Utilizing a separate processor and amplifier allows the user to improve the quality of equipment over that which is offered by most receivers. An added benefit is that when the processing technologies change so much that a new processor is needed, you can still keep your amplifier. This, theoretically reduces the cost and waste associated with upgrading your equipment. The AV8003 is housed in an aesthetically pleasing chassis with rounded corners and a clean front panel that features a large display window above a drop down door. The window is flanked by a pair of large knobs that control input selection and volume. Noticeably absent are the plethora of initials and symbols which are instead discreetly places on top of the front panel. Looking inside one can see the heavy copper plated steel chassis with an enclosed torioidal transformer with all the parts carefully laid out to maximize performance. The AV8003 is feature laden and can even be hooked up to your computer network to stream pictures, audio and video. This three zone processor also features more of the features that one might expect to find in a new surround processor including HDMI 1.3 support, DTS-HD Master Audio, Dolby True HD, HD radio tuner, XM and Sirius ready, Anchor Bay Technologies video scaling and Audyssey room correction. I've left out several features as there are simply too many to list in this article. Trust me, this sucker is packed with technology. Despite the plethora of features the intent of the AV8003 was not to be a feature showcase but rather provide class beating performance. There are many other products out there with even more features, one only has to look at Marantz's sister company Denon for such products, but features for features sake does not always mean a benefit for the user. With the Marantz AV8003 the designers made many conscious decisions of what to include and what to dump and these decisions were primarily based upon performance. While I had some difficulty setting up the networking aspect of the AV8003, the rest of the setup was straightforward. Marantz has achieved its intent with this piece. The AV8003 performed extremely well with both video and audio. One would most likely have to spend multiples of the AV8003's price in order to obtain significantly better performance. See more at Capital Sound here. If you have any questions or inquiries, please contact us and we will assist you with your purchase.